As an elementary school malcontent I was given to age-appropriate “slight of hand” strategies for begging off school. What I lacked in sophistication I made up for by sheer volume of attempts. In time the ‘sick day’ was my primary tool. I actually figured out that my chance of success was greater early in the week, say Tuesday or Wednesday, than later. Frankly, I needed Monday to survey the remainder of the week; school wasn’t all bad even at that age. Additionally, weekly attempts were of little value because the pattern was too easily exposed, hence a measured response worked best. Game shows were a marvelous way to escape the tragically mundane afternoons between morning cartoons and late afternoon reruns (i.e. Gilligan’s Island, McHale’s Navy, the Flintstones, etc.) on the days my dubious plot was successful. I could name all the biggies of the time, Let’s Make A Deal, Hollywood Squares, etc., but the game show that comes to mind is The Match Game. Like Hollywood Squares, this show had regular stars too, the most notable was Charles Nelson Riley. Riley, a lesser version of Paul Lind of Hollywood Squares fame, provided many afternoons of funny one-liners meant for adults but childish enough that I laughed out loud anyway. It was always great fun to see the contestants actually win money and prizes. The really tough hours were after game shows ended for the day, leaving those oppressive 60’s era soap operas as the only viewing option, worse than medication-free dental visits for a preteen I can assure you. I soon discovered the expectation I had for ‘fun times on the lamb’ never matched reality. 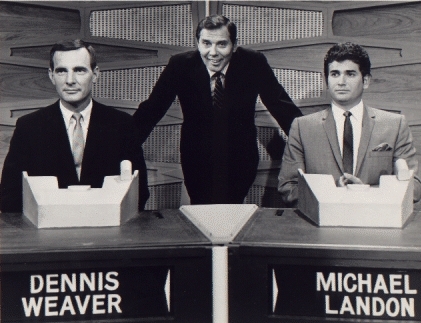 Being a teenager in the 1970’s was exactly like trying to guess how the star panel would fill in the blanks of the statements read by Gene Rayburn. First, there is NEVER a right answer; second, if there is a right answer the panelists NEVER used it when you did! Matches were elusive. In high school it was only the popular boys and girls that would pose in the main hall between classes and during lunch time. Pretty girls would cluster together whispering in low tones each time a school jock walked by. Any lustful glance back at the hens was rewarded with shy smiles and nervous giggles. The cool guys mostly spread themselves out along the walls just far enough apart that it was easy to hear their attempts at clever, sarcastic wit. I’m sure the likes of George Carlin, Sam Kinison and Robin Williams started out this way. My place on the wall remained elusive despite being a wrestling jock and generally a class clown type. I never filled in the blanks correctly in high school for the ‘star panel’ of the wall, I didn’t drink, I didn’t sleep around, I didn’t smoke, and I didn’t cuss. At the time, I believed all of my “didn’t”s were the way to correctly fill in the blanks of life. By the time my 30th high school reunion came along I realized I hadn’t fared better than the wall posers at filling in the blanks to life. Some made out better, others worse. For all my moral high ground stances (didn’t drink, smoke, cuss, etc.) I managed to go through two wives, one bankruptcy, a few career changes, and one ugly IRS audit. I moved to Washington State in 1993 after spending 16 years in Arizona. My first contract job in Seattle lasted a full eight month before ending suddenly. Naively I believed my job shop would find me another job, after all, I was a captive consultant while my contract was viable. Wrong answer! So here I am suddenly without income, a struggling marriage, and bills to be paid. For a month I submitted my resume to job shops for work, I even got submitted to a number of companies. All said I lacked the experience they were looking for! WHAT? My level of work was better than most consultants I’d worked with that were making much more than me. I had modestly raised my asking rate but when met with all the declines I lowered it again; still no success at finding work. At the end of that fateful month in a moment of clarity I proclaimed, “I can be as unemployed at $30 an hour as $20 or $25 an hour!” I informed all the job shops my rate was now much higher. I realized my lower rate was the wrong way to fill in the blank, it indicated I was ‘entry level’ and didn’t match their expectation! At the new ambitious rate I had two contract offers a week later. I went from zero income to over $10k per month by finally filling in the blank with what I honestly believed I was worth as a software developer. From all this I conclude, the best answers to fill in are the honest ones, the ones that are learned from life’s dispassionate lessons, the ones which don’t require climbing into someone else’s mind to figure out their folly or sense of fair play. Winning one round of The Match Game of Life doesn’t mean I have it all figured out of course, those dispassionate lessons I referred too previously are still being taught. But armed with the right strategy, the prizes I win have value and meaning to me now. Until next time, I hope all your Matches are the right ones! This entry was posted on Monday, February 18th, 2008 at 10:22 am by Tim Hief and is filed under Blogroll, Uncategorized. You can follow any responses to this entry through the RSS 2.0 feed. Both comments and pings are currently closed. I'm glad you're still posting here, Tim! You really should publish these essays; they're great. Thank you Cassie. I think on one occasion my mom finally fessed up to knowing my ruse. She figured I'd get 'sick' of staying home eventually. I mean, getting behind in work and missing out on playing in the afternoons with friends… it was a self cure to the behavior. Tim, your blogs are so creative and interesting to read. Your first part about trying to get out of school brought back memories to me of trying to do the same thing. At first my mother would tell me I had to stay in bed if I was sick, but she would relent and let me come out to the sofa, I remember we always watched the Price is Right. That was a big one when you were home from school. You are right though, right around one o'clock her "stories" came on and you were wishing you had gone to school!